A press release dated July 9, 2009 and titled “Environmental Manganese Good in Trace Amounts But Can Correlate to Cancer Rates” provided evidence from a recent study which found a correlation between manganese in groundwater and increased cancer rates. While not necessarily a direct link, it does give researchers reason to explore the matter further and well owners even more reason to check the manganese levels in their well water. WINSTON-SALEM, N.C. – In the first ecological study of its kind in the world, a Wake Forest University Baptist Medical Center researcher has uncovered the unique finding that groundwater and airborne manganese in North Carolina correlates with cancer mortality at the county level. The study, titled, “Environmental Manganese and Cancer Mortality Rates by County in North Carolina: An Ecological Study,” was published online last month by Biological Trace Element Research. Lead researcher John Spangler, M.D., professor of family and community medicine at Wake Forest Baptist, found that groundwater manganese appears to be positively associated with total cancer, colon cancer and lung cancer death rates, while airborne manganese concentrations appear to be inversely associated with total cancer, breast cancer and lung cancer death rates. To determine whether environmental manganese is related to cancer at the county level in North Carolina, Spangler conducted an ecological study using data from the North Carolina State Center for Health Statistics, North Carolina Geological Survey, U.S. Geological Survey, and U.S. Census. 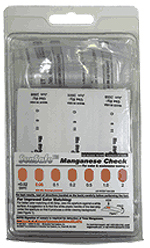 For the longest time testing for manganese in groundwater required the use of multiple messy liquids (see HMT Manganese Test Kit) and the results often had false positives as a result of interferences from other metals. Recently, though, a water testing breakthrough called SenSafe Manganese Check eliminated the need for ALL liquids except the water getting tested. 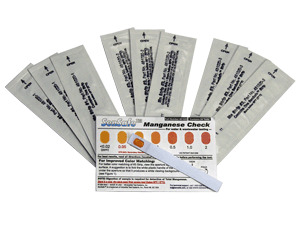 Additionally, users can complete testing for manganese in water within a matter of minutes.